Christmas is a time of celebrations and gifts, where we overload our loved ones with presents and delicious food! Sadly, it’s not only our loved ones we overload, but too often this season is also marked by overloaded bins spilling into the streets. It’s important that we recycle as much as we can to minimise the impact of our Christmas waste on our environment and community. So make sure to recycle correctly and don’t miss your bin collections, as the collection dates will change over the Christmas period. This page however is not about recycling your Christmas waste, it’s about making sure you don’t end with all those excess bags of rubbish in the first place! The best impact on our environment and society is no impact at all! Discover how to give better, re-think your Christmas tree and decorations and eat everything this Christmas. Don’t forget to tune into our Facebook and Twitter feed to get inspired by many more jolly tips and tricks on recycling and reducing your waste! What if you would take a mental snapshot of the picture above and let this guide you for all the gifts you will be giving this jolly season? Not only will you reduce the rubbish your gift brings, not only will you make the world a better place, not only will you support local economy – chances are high you will also be loved even more by whoever is on the receiving end. The concept is simple: look for any of the alternatives as shown on our upside-down Christmas tree before resorting to just buying something. The nearer the trunk you find an alternative, the better! In our busy communities, time is more valuable than ever, than anything. And time with your loved ones is priceless! So wrap up your time and put it under the tree! Maybe this would be in the form of a (self-crafted) voucher they can redeem when they want to spend time with you or perhaps this can be an invitation to a special day with yours truly. Or volunteer some of your time for their favourite charity. For those with a specific skill or talent, why not offer your time to teach a friend or family member to make something new or offer your time to help with a project or activity such as DIY or gardening? Don’t have enough time to give? Give someone a memory, an experience they will never forget and that won’t end up in the bin. Buy them event or concert tickets you know they will love. Look at paying the membership fee for their favourite club. Get them signed up for a workshop to master their hobby. Book them a day they will never forget which perhaps they can even spend with a loved one. To upcycle is to “reuse (discarded objects or material) in such a way as to create a product of higher quality or value than the original”. Or simply put: save items from the bin by giving them a better purpose. To give an upcycled item is not only saving items from going to waste, it also means giving some of your time spent on upcycling the item. There are plenty of ideas and examples out there of upcycling common day goods. Our best tip is to start simple. Repair their favourite toy. Apply a new lick of paint on their blemished cupboard. Or have a look at these for some more inspiration. Don’t have time to spend on upcycling? 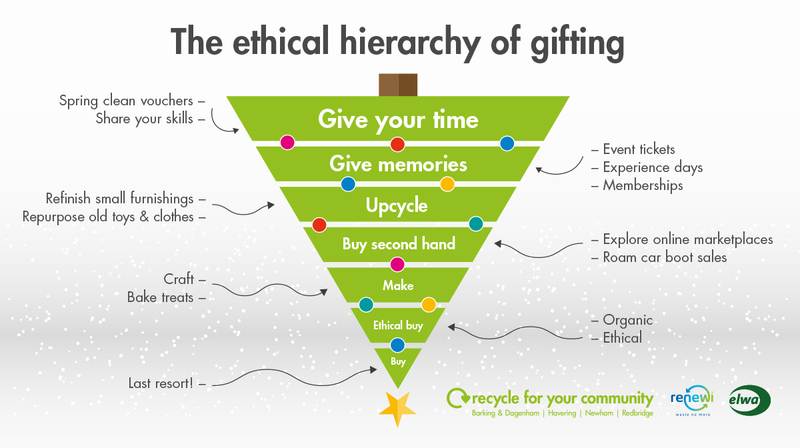 Search for upcycled gifts to buy instead. Relove your stuff! (Or someone else’s!) Pass on the love and give a gift that you got to someone else that has better use for it. Or browse your collection of stuff and find something that you no longer have a use for, that you have outgrown or that you are simply tired of… this might just be that thing that someone else will cherish! Spend a fun and interesting morning discovering second hand treasures at a local car boot sale or cast your net a little wider and explore the many online marketplaces that sell anything you can think of in a new-for-you condition. Make an artwork, bake gingerbread (wo)men, knit a Christmas jumper and crochet a matching bonnet, pour your own soap, craft candles, infuse gin with the weirdest botanicals or turn your kitchen into a brewhouse! Get those creative juices flowing and amaze your loved ones with a truly unique gift. Look for alternatives to the products you would usually buy that are more eco-friendly, more ethically, better for the planet and the people. Look for descriptive keywords like the once listed below and let us help you understand why they matter. The range of ethical products is ever-extending and there’s plenty of online guidance to find the really right thing to buy. And don’t forget the wrap. We’ve got the perfect guide on Eco Friendly Wrapping. More seriously, if you do find yourself here, consider buying a gift card or voucher they can redeem either in one specific store or a range of stores. This will allow them to choose something themselves and reduces the likelihood of it ending up in the bin. If you do decide to buy something, at least make sure to keep the receipt – so you can return it (if necessary)! We have been decorating trees since the 16th century. They were traditionally decorated with edible items such as apples or nuts. Today in the UK we buy millions of Christmas trees, but sadly very few of them are replanted, let alone composted and end up in landfill come January. There are all sorts of alternatives to a real or artificial tree. You could decorate your pot plants or how about creating a Christmas tree out of a ladder, some chalk or a pile of books? If you are going to buy a real tree, look for one which can be planted back outside again. If you get a cut tree, find one that has been responsibly sourced and check that your local authority can compost the tree in January. Homes were traditionally decorated with natural materials and greenery at Christmas. Instead of buying plastic decorations why not try some alternatives which will make your home look and smell fantastic and which can be saved for next year or composted come January. Holly, ivy, berries and pine cones can be cut and made into wreaths or garlands to be hung. Oranges can be used to make beautiful hanging decorations for indoors and outside. You could also try using ribbon bows, cinnamon sticks, gingerbread or try your hand at making salt dough decorations. The whole family can have fun making and baking decorations for your home this Christmas. For some more green ideas on how to decorate your home this year check out our post #GreenerChristmas Crafts. Whilst we all like to eat enough to feed a sleigh-full of reindeer at Christmas, we buy and cook more than even our bloated festive bellies can handle. On the big day, the UK throws away around 4.2 million Christmas dinners. That equates to 263,000 turkeys, 740,000 Christmas puddings and 17.2 million Brussels sprouts across the UK. And costs us £64 million. Pre Christmas, try to avoid getting caught up in the Christmas spirit. Instead, make a carefully researched list… and stick to it! If you’re cooking for more people than usual, use the Love Food Hate Waste Portion Planner or the BBC Good Food Christmas Portion Planner to help you buy and cook the right quantities. On Christmas day, only load up what you are going to eat and when finally everyone has finished snacking, store in reusable, resealable pots and keep cold. A chilly garage or garden is useful extra space for leftover vegetables when the fridge is fully loaded with meat. Post Christmas, start using up your saved left-overs. Leftover vegetables go great in pasta dishes, stews and soups. You can even add any old bits of cheeses in to make them extra tasty. For some great leftover recipes, look here. If you’re facing Cheese Mountain, you can always grate or crumble it, freeze it and then use it later on pizzas, pastas and, well, everything really. Cheese is always delicious. Boil up the turkey bones to make stock. And if you’ve still got turkey left but can’t face the thought of it for at least another month, freeze it and eat it when Turkey Fatigue passes in January. Leftover wine can be frozen in ice cube trays and added to stocks and gravies at a later date. The other open bottles can be turned into New Year’s Eve cocktails and mocktails. If you need more freezer tips then check out Love Food Hate Waste’s Love Your Freezer page to help you banish food waste this Christmas (and beyond).